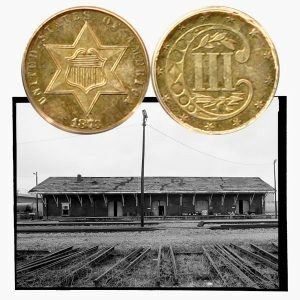 Today, the Silver Trime Three-Cent Coin remembers when they drove the last spike for the Memphis and Charleston railroad on March 27, 1857. The entire distance from Charleston to Memphis is 756 miles. For the convenience of travelers we append a table of distances. In 1851 the first contracts for the construction of work on the Memphis and Charleston Railroad were let and Governor James C. Jones being elected to the United States Senate, was succeeded in the presidency by A. E. Mills, of Huntsville, Ala., who finished the contracts made by Jones. This exhausted the treasury and increased the embarrassments the company labored under of not having a charter from Mississippi granting right of way through the northeast corner of the State, which was opposed by the jealous friends of the Mississippi Central Railroad. In order to overcome this hostility, Mills and Sam. Tate agreed for their road to subscribe $125,000 to the capital stock of that concern. When submitted to the board of directors of the Memphis and Charleston Railroad, this contract was indignantly rejected, some of the directors declaring they would resign before accepting a charter on such disgraceful terms. But President Mills and Secretary and Treasurer Sam. Tate, though disappointed, did not despair. They were the active officers of the road, were carrying the burden of responsibility, and everything depended upon them, — Mills on the eastern, and Tate on the western division. Tate renewed the contract with the Mississippi Central, and threatened to resign if the directors did not ratify it. On the 1st of April, 1854, it was ratified, after a stormy debate at a meeting of the directors held at Tuscumbia, Ala.
Mills resigned the presidency, and Tate, after a great deal of persuasion, accepted it. He was the man for the place, the man the public had been looking to, and in whom the people had confidence that he had the ability to build and manage the road. Making careful calculations, Mr. Tate decided to call a meeting of the stockholders at Huntsville, to whom he stated that $2,000,000 had already been expended upon the work, and that $1,600,000 would be necessary to complete it, $400,000 of which he must have at once to finish existing contracts. All of his recommendations were adopted at once, and $312,000 of the $400,000 was subscribed. He had infected the stockholders with his own enthusiasm, and they urged him to proceed with that amount, but he refused, saying it would not be honorable in him to speculate at the risk of men whose bread depended upon their daily labor. After the adjournment of the stockholders’ meeting, Tate, with rare energy, made a tour of the valley, and visited every one of the larger stockholders, and persuaded them to subscribe still more, returning to Huntsville with all but $13,000 of the amount needed. There he was met by the whole population, who welcomed him with cheers. In the speech that he made, in response to their hospitable greeting, he reported his success and what he wanted, when the sum was immediately subscribed by four of the by-standers. Mr. Tate then announced that the enterprise would be a success and that it would be completed by the 1st of April, 1857. He proved to be a true prophet. It was completed as already stated, on the 27th of March, 1857. The Memphis, Louisville, the Mississippi and Tennessee, and the Memphis and Little Rock Railroads were at this time making rapid progress. The city was advancing with immense strides, great blocks of buildings were being constructed, the foundations of some of them being laid by gas-light so great was the demand for stores and dwellings. This was due almost altogether to the Memphis and Charleston Railroad, which traverses a belt of country that cannot be surpassed on the globe in respect to mildness and salubrity of climate; the diversity of agricultural products; variety and fertility of soil; value and abundance of coal, iron and other mineral deposits found at convenient and accessible distances; the variety and quantity of its timber, and supplies of water, coal, iron, etc., found in veins of four to ten feet thickness, eighteen to forty miles south between Dickson Station and Chattanooga, and on that portion of line east of Huntsville to Chattanooga. The line extends from Memphis in a line almost due east to Chattanooga, on the south bank of the Tennessee River, a distance of 309 miles, running along parallel thirty-five degrees north latitude through its whole course, traversing the following counties: Shelby, Fayette, Hardeman and McNairy in Tennessee; Tishomingo in Mississippi; and Franklin, Lawrence, Morgan, Limestone, Madison and Jackson in Alabama, connecting at its terminal point with the whole railroad system of the South. A few weeks after the railroad jubilee a meeting of influential Presbyterians sent a communication to the press reflecting upon the management for running trains on Sunday. This the Appeal dismissed as scarce worth mentioning. But it made more than a ripple, and was for a time almost as serious as the charge that the road was doing a commission and forwarding business, which President Tate explained away to the satisfaction of the board of mayor and aldermen, which had become tediously garrulous to a degree that called for remonstrance on the part of Alderman Elder, who, being a thorough man of business, appreciated the value of time. There was scarcely a question mooted that was not debated, and sometimes with an amount of choler far beyond any value it could possibly have for the public. The Silver Trime Three-Cent Coin shows with an image of the Memphis and Charleston freight depot in Huntsville, circa 1960s.